At the start of last year, Jim and I were asked to work on a book that we were particularly excited about: a set of Fair Isle patterns put together by the immensely talented knitters of the Shetland Guild of Spinners, Knitters, Weavers and Dyers. We have worked with a number of Shetland designers over the years, both through books and collections with Jamieson & Smith and later with Kate Davies on The Book of Haps, so I knew that it would be a fascinating project, and that while some of the contributors would be very familiar with the pattern writing process, for others it would be their first experience of producing instructions for others to follow. This is exactly the sort of challenge that we enjoy! In the event, there were so many brilliant designs submitted by the Guild that they were divided into two volumes – yes, there's more to come! The first volume of the Guild's book of Fair Isle designs has now been published, and I know I'm totally biased, but I think they've done a brilliant job on it. The book is A4 sized, and space has been given to each design. The charts get a full page to themselves for each pattern, and the instructions have been laid out so that they are easy to follow, with lots of clear photos for each project. One of the touches that I was particularly happy to see was that "in progress" shots have been included for a number of the designs. These give extra insight into some of the more unusual constructions, including that of the adorable bonnet that features of the cover of the book, and Hazel Tindall's Sandison Yoked Jumper. The Guild also took the step of having each pattern test knitted prior to publication, which has allowed them to include photographs of alternative colourways for almost all of the designs. Outi Kater's Snow in Kergord mittens are a great example, where the medium size is in a red and blue colourway, with an alternative all-blue combination used for the large size. The book is absolutely packed with patterns, containing 12 accessories and 4 garment designs, with everything from simple phone covers and wristwarmers, up to waistcoats and sweaters. Jim and I really enjoyed discovering some of the many ways that Shetlanders use to create these beautiful pieces - from steeks to "brak and eke" (the process of working flat with all rows worked from the right side and the yarns broken and rejoined on every row). There is a detailed section at the start of the volume containing tips and explanations of the various skills required for the patterns in the book. Another of the many joys of the book is the short biographies that Helen Robertson has put together of each knitter. These panels speak to the rich sense of community, as well as the enormous pool of talent and skill that has been passed down through families as well as generously shared within the Guild, and now to knitters throughout the world in the pages of this book. Some years ago, I had the absolute pleasure of spending an afternoon in Hazel Tindall's living room, chatting about knitting and publishing patterns and other bits and bobs. It was an enormously inspiring afternoon, and one I hope to repeat at some point in the future! Not everyone has that opportunity, but thanks to modern technology, you too can now imagine you're spending an afternoon with not only Hazel, but also Elizabeth Johnston (this year's Shetland Wool Week Patron)! Hazel and Elizabeth have released a DVD (also available to stream via Vimeo) called 50 Tips from Shetland Knitters. This is the perfect companion to the Guild's Fair Isle book reviewed above. Hazel and Elizabeth have between them an extraordinary quantity of knitting experience, and in this DVD they take you through their top tips, shortcuts, and hours of valuable knitting advice. There is something for everyone to learn from this DVD, no matter how long you have been knitting. Indeed, Hazel and Elizabeth learned from each other during the making of the DVD! The basic format is that Hazel and Elizabeth talk you through their methods, with filming from both face-on and over-the-shoulder perspectives. Their samples have been chosen to clearly show off the techniques being described, and they both have an excellent teaching style and are easy to follow. Their calm, authoritative manner makes even the most complex of techniques feel manageable. My only wish for the DVD is that it had been given a menu at the start, to more easily allow you to jump straight to the required chapter, rather than skipping with fast forward or reverse. This is a small point though, in view of the quantity and quality of tips included in the DVD. If you haven't taken a class with Hazel or Elizabeth, I would highly recommend purchasing this either as a download from Vimeo if you're overseas, or a DVD if you're based in Europe, it really is the perfect companion to Fair Isle Designs from Shetland Knitters, and your knitting skills will be greatly enhanced by both the book and DVD. 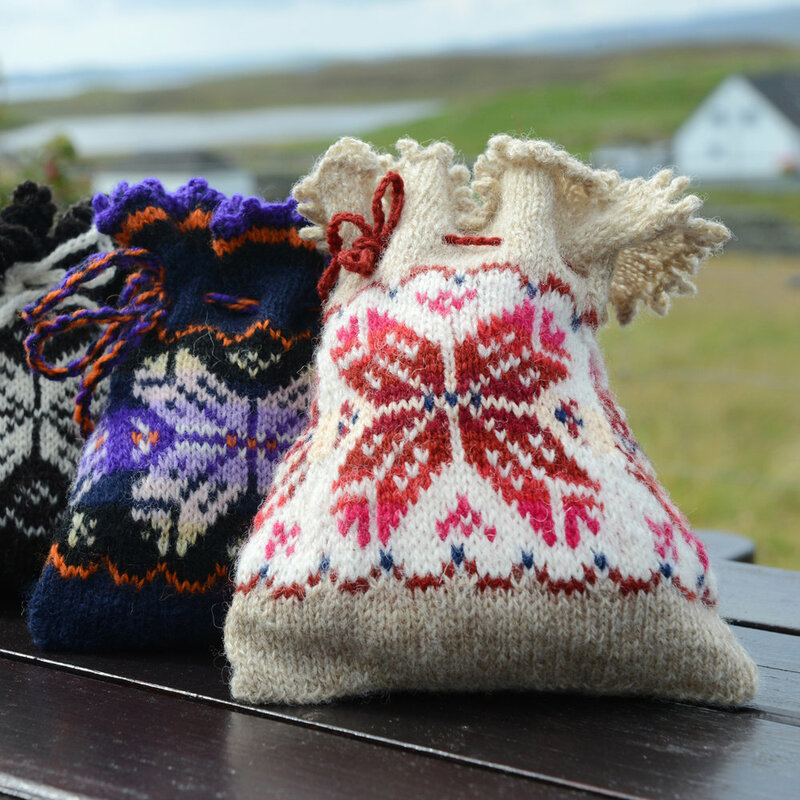 We have copies of Fair Isle Designs from Shetland Knitters Volume 1 available in our online shop for £21.99 plus shipping, as well as a number of yarn only kits to accompany the patterns, starting at £16.00. 50 Tips from Shetland Knitters is available on DVD (in European PAL format) for £25.00 (plus shipping) from Jamieson & Smith and other shops in Shetland. Alternatively it is possible to stream and download 50 Tips from Shetland Knitters from Vimeo worldwide for £23.21 (exchange rates may vary). Disclaimer: Hazel Tindall kindly gave me a copy of her DVD for review, but I've not received any other payment for reviewing 50 Tips from Shetland Knitters.